More than 25 years of experience in the document automation workflow industry allows me to confidently tell you that current automation technologies and solutions work, without a doubt. I have seen great examples of improving business processes in a wide range of vertical markets such as mortgage refinancing, new car loan approval and even placing document scanners in ambulances — all using digital transformation workflow solutions. A simple internet search for “document automation workflow case study” will provide plenty of evidence that these technologies work. However, we are an industry in convergence. With that in mind, what is the future of document automation workflow for vertical market applications? Obviously, cloud computing is a much more mature market than when Benioff uttered these famous words. I share this because this is exactly where we are in the document capture automation industry. We have a great opportunity to design, build and deploy innovative solutions that we’ve never seen before to drastically improve workflow efficiencies. This truly is the Renaissance of the document capture automation workflow industry. Let’s take a look at three technology megatrends and provide a real-world vertical market use case scenario for each. 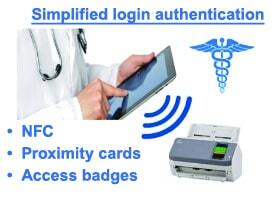 The first trend is simplified ease of use with identity and authentication login for healthcare. 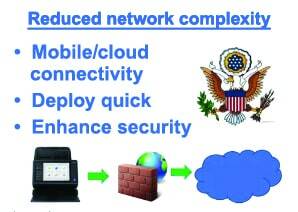 The second is reduced device connectivity complexity with cloud web services for state and local government agencies. The third technology workflow megatrend is an effective device and application control with centralized management for retail outlets. It’s a fact that healthcare is a very data-intensive industry where life or death decisions are literally made using information captured from paper documents such as patient intake forms, doctors’ notes and other medical records. It’s critically important to make access to this information secure yet highly accessible, to doctors and nurses as well as other healthcare professionals. However, fundamental requirements such as the login authentication process are often far too cumbersome and are neglected as a critical part of ensuring successful outcomes in healthcare. Most of us are familiar with the traditional method for using a username/password combination to securely log in to a device or software application. This certainly works, and should be used as one form of login authentication, but why not use newer, more modern forms of login since they are actually much easier and also greatly enhance security? One type of this technology exists in the form of biometric identity login using your unique face, voice or fingerprint. Or if this seems too creepy, then you can use your smartphone device — which most of us carry with us at all times — to log in via a secure chip. This technology is used in items such as proximity cards, access badges or Near Field Communication (NFC). By using these types of innovative secure login technologies, the workflow process of accessing and contributing data in healthcare is made much more convenient. Imagine a scenario in which using a proximity card, a doctor gets within two feet of a scanning device and is automatically logged in. After scanning the documents and walking away, he is automatically logged out once outside the two-foot proximity range. In this new workflow, the doctor has spent literally seconds doing what traditionally has taken several minutes and caused a lot of unnecessary frustration due to the cumbersome login and authentication process. State and local government agencies, by their very nature, have distributed computing networks made up of one central location with many remote office locations to provide public services such as unemployment, business licensing and various forms of social services. All of these services require documentation as part of an approval workflow process, and delays in acquiring documents and — more importantly — data from these documents can cause further delays, be more expensive to process and cause irritation for tax-paying citizens who rely on these government services. Therefore, including the point of client/service transaction in the document automation workflow process by providing a document scanning device to each state agency sounds ideal, right? Yes, it is, but there have traditionally been communication challenges when it comes to installing on a network with firewall and network reconfiguration required. However, with the emergence of web services, new communication and connectivity standards make deploying distributed document automation solutions much easier — solutions with enhanced security and greatly improved operational workflow. How is this possible? Without getting overly technical, nearly all new document scanning devices offer embedded web services, or web API. This simply means that it is possible to communicate directly to a document scanning device instead of relying on an intermediate scanner driver running on a computer. This concept is similar to how AirPrint functions, where you can print directly from your mobile device over the internet to an internet printer. In the case of a document scanning use case scenario, users are scanning from a device (e.g., a network-attached document scanner) instead of printing to a device (e.g., a network-attached printer). Web services simplify connectivity of document scanning devices, so your next natural thought might be, “There must be a security tradeoff.” This is true if network administrators have to do a network reconfiguration to open inbound firewall ports or make network-address translation (NAT) exception rules in order to communicate over a network, a process which is less than ideal and not recommended. However, just like web services affords us a simplified way to provide improved interoperability, we can also utilize SHyPs (Smart Hybrid Protocol) web services to establish secure communications without opening any unnecessary inbound firewall ports. SHyPs use standard communication ports, which are common and typically available on networks, so there is no longer the need to reconfigure a network firewall and expose a potential security risk. Now state and local government agencies can simply plug a document scanner into their network — a solution that requires no extra network reconfiguration and realizes the benefits of a much more efficient document automation workflow processes for client services without the sacrifice of security. The last of the three technology megatrends to improve workflow processes is the concept of centralized device and application management. One of the most easily illustrated examples of benefiting from centralized management is in the vertical market of retail outlets. There are several use cases for document capture automation in retail outlets including collecting and submitting cash register receipts into the accounting workflow on a daily basis, submitting completed resume forms into the human resources workflow, and submitting the cleaning documentation into the compliance workflow. Retail outlets are businesses with remote locations including gas station chains, food and restaurant franchises or hospitality establishments. Regardless of the exact industry, the common theme among retail outlets is the need to collect and process information like accounting data, human capital forms, and compliance documents through a workflow. With centralized device and application management, consistency and job control can be pushed out to these retail outlets. For example, in the case of reconciling receipts on a daily basis, an IT administrator can set up one simple button on the document scanning device touch screen that always sends the scanned images to the same location. This eliminates the possibility of the document workflow getting sent to an incorrect location and makes it not only easy to use the device, but also secure and efficient for the users themselves. 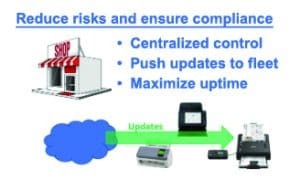 Additionally, with centralized device management retail outlets can ensure that they maintain maximum uptime by being able to detect problems and proactively take corrective action. A rather obvious benefit for mechanical devices such as document scanners surfaces when they require occasional replacement of their consumable parts. In these cases, a centralized device management system can notify a retail outlet store manager about where replacement parts can be ordered, and necessary service can be properly planned in advance as to not disrupt the workflow process. Why isn’t every organization using these sorts of document automation workflow solutions? They will eventually, in some form or another. It’s simply too logical from a strategic business point of view not to, and if organizations don’t have to sacrifice — much less improve — security, then it’s just a matter of increasing awareness before mass adoption of a particular technology solution happens. The truth of the matter is that technology has outpaced most people’s comprehension of what can be done with these innovative tools. These tools need to be integrated into solutions, which will certainly happen with industry consolidation. However, what will always be needed is people (i.e., human capital) that have subject matter expertise in a particular vertical market. There simply is no magic technology, nor solution that “just works” right out of the box, and deploying effective document automation workflow solutions has to fit within a particular organization’s business and culture, not vice versa. In summary, I hope you can appreciate some of the new tools and techniques in document automation workflow for the vertical market that are out there, waiting to be utilized. Hopefully, we can take industry-proven technologies and make them better with simpler authentication login for better user experiences, reduced connectivity complexity and higher levels of security with web services, as well as providing additional workflow efficiency with centralized job/device management. After all, we are in the Renaissance of the document capture automation workflow industry. Kevin Neal is founder and CEO of P3iD Technologies.